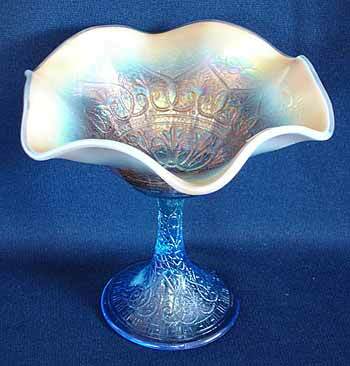 A rare Hearts and Flowers bowl in aqua. The iridescence on the front makes it difficult to see the color of the glass, but the photo on the right displays the aqua through the base. 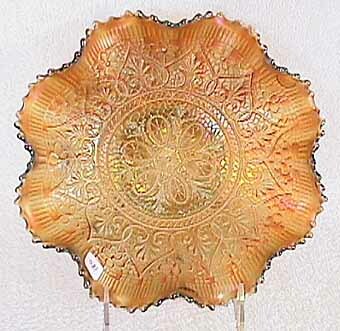 Ruffled with a ribbed back, it sold at the 2003 International Carnival Glass Association auction for $1,000. Photos courtesy of Seeck Auctions. 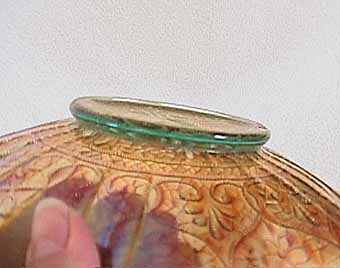 This Hearts and Flowers compote was listed at powder blue opal at the 2005 auction where it brought $3,250. Photo courtesy of Seeck Auctions.